Along with adding the cut remixed battle theme, I think, if possible, it would be pretty cool to fully implement the cut battle theme instrumentation change when traveling to different time periods. 2300 AD could have futuristic sounds, 12000 BC could use instruments that are present in tracks such as "corridors of time", etc. 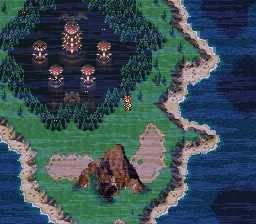 Also, it is speculated that the Singing Mountain dungeon has some significance towards Ayla's backstory. Although it's just speculation, it would be cool to see the mystery of this cut dungeon resolved in this way rather than it just being a filler dungeon. I don't agree at all at giving Schala's story a resolution. It seems to be beyond the scope of the hack itself as simply an expansion of the existing game. I know many people dislike Cross, but instead of altering Trigger to disallow for it it would be better to let someone else do an improvement project for it. The only way that I would feel comfortable with rescuing Schala is if it were a new non-canon, alternate ending like the one where the Reptites take over. As for changing the dialogue for 600 AD, If this was done, then in order to keep the feel of the original you'd have to make Frog somehow even more eccentric. Maybe by way of adding some quirk to his speech beyond the old-fashioned English. Something like making him extra formal at all times and ending most statements with something equivalent to Mog's "kupo!". Alternatively, you could drop the "shakespearian" style and just make him speak very formally at all time, never use contractions like "can't", and adding the aforementioned kupo equivalent. I see some very good ideas here, and I completely agree with both of Vanya's points. Woodman's idea sounds great, and I once tried to implement the feature of unique instrumentation myself, but in the end it boiled down to having a different ROM for each time period, each ROM having a different version of the battle theme. As said, the whole bit about Schala never being found does bother me, but it sounds more like something that would have been best dealt with in a sequel or side game because something quick (like most of the game's side-quests) just wouldn't be satisfying given the magnitude of everything leading up to her disappearance. Unless this side quest was given a some length.. With you on the Schala disappearance never sitting well thing. It seems reasonable that a sequel was intended and thus all the holes and unfinished plot points. It had that "To be continued" feel. What could have been..
And for the record, Chrono Cross, while made by Square, didn't have the same teams creating it and was simply too far removed from the original story and overall "feel" to be a true sequel. So the idea of linking the two deliberately through Trigger is just not that great an idea. Cross was mot of a "what if" side story thing. Based on it's own merits, it was a good game. But Trigger far outshines/outclasses it! speaking of Magus, in all his artwork and the video cut scenes his cape is red, it would take literally 15 seconds to make his in game cape red What do you guys think of that? I think purple fits his personality better. Red seems a little more grandiose which IMO doesn't fit his dark, brooding personality. Just my 2 cents. That would be good for an optional patch since I can see some people wanting it (me!) and others not. While StarGate is right about purple matching his personality better, the colors kinda need to match to keep things within the game consistent. Although an argument could be made that the Red cape reflects his inner anger and rage over the loss of Schala.. So perhaps the change would be good. Just a thought. EDIT, given a few more moments of thought, the idea is growing on me. Red seems like a good change. Would be interesting to see nonetheless. Might be like having Dracula in your party. I work today, but sometime this afternoon I'll get lex to take a pic of it for me so you can judge better. 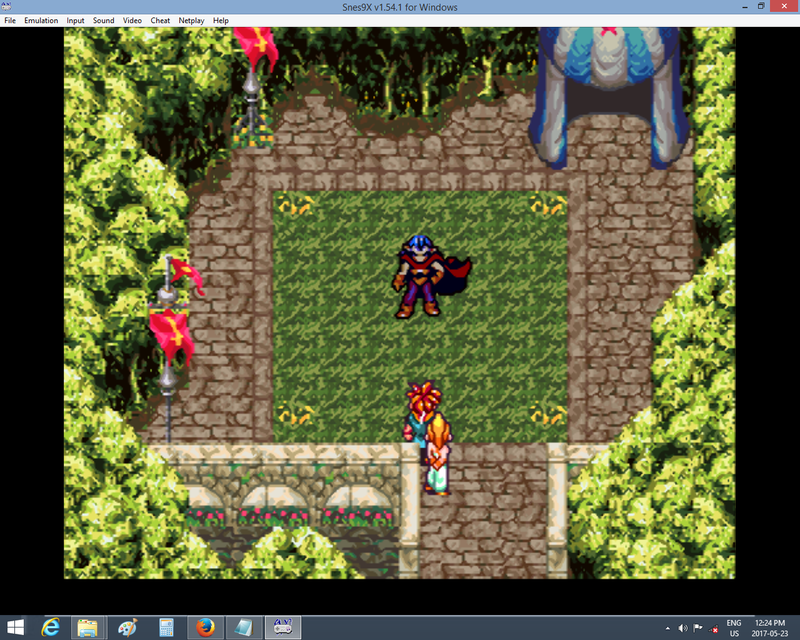 I think there was a reason they coloured Magus' cape purple in the game. It fits the rest of his palette, as well as his behaviour and personality. The purple on him is used in a good chunk of his sprites on every area so it'd look REALLY awkward if changed to red. Unless it was a very deep, dark red, though, I'm pretty sure it'd effect his hair too. Just keep it purple. This is an addition thing, not a full on remaster or modification of CT in every way. I've tested it myself with a dark red and it looks pretty good, the only thing his cape palette shares is likely his prophet robes, there is definitely interest in this and since its literally 15 seconds to change I'll post a pic and let people judge. I'm opting for an optional patch to change Magus' cape colour. I mean, the Prophet's robes were perfect in purple and in the end it's a pretty minor, but controversial change. I just took 2 minutes and made an optional IPS for the red cape that will be included in the Zip. Everybody wins. I like it! Looks good. You can't change the anime-scene cape color, so this a good fix. The optional patch is also a good idea for those that may like the original. Enemies are almost done, events are as well but slower, won't be long now. I found a full map of the Zeal dungeon and I have a pretty good use for it. Imagine on the second visit to Zeal that the door to the throne room is blocked so you have to take a secret passage to get in. Not sure if this is worth delaying the release over though. I think it won't be a problem to delay the release for that! All events are done, just have one map to add enemies to, fixed some bugs and refined a few of my maps a little, the Zeal dungeon shouldn't take very long as its just a single map.